I used AVKO (pdf file) for my children. C is making up his own typing program (or will be until I print the AVKO exercises out for him), and we're using an online typing test to check speed. OK, I just attempted to take the test and was, predictably, interrupted by household stuff just before the end. 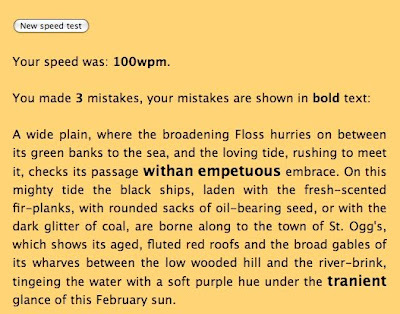 Still managed to score 100 wpm with 3 mistakes. * Can't bring myself to speak of keyboarding. Does Fed Ex have some sort of psychic ability to KNOW when people are taking timed typing tests? 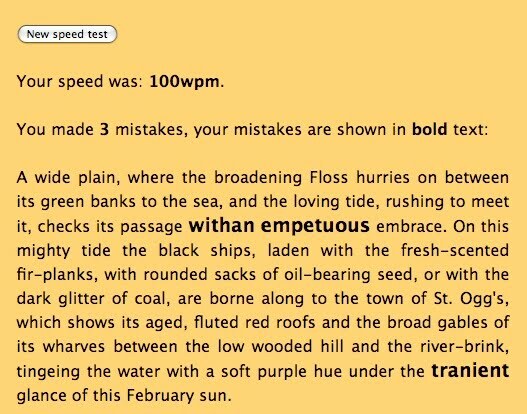 Well, I'm nowhere near your speed (46 wpm, 3 errors, no interruptions--I am unworthy of being interrupted in a typing test), but I type well enough for my own purposes. 1. My mother showed my where to put my fingers on the home keys (I think I was about 12 at the time). 2. I typed all of my high school/college papers while staring vaguely at the keys while I typed and looking up at the computer screen occasionally. 3. I wrote a dissertation (way more extended periods of typing than my previous experiences). By the end of the dissertation, I could type at a reasonable speed, and without looking at my fingers for anything except the occasional number or punctuation mark. Certainly, it would have made things faster along the way if I had "learned to type" at some point, but if you have just a small amount of instruction, and life provides practice, you can learn to type without going through a specific set of exercises. (I am still lousy at typing program exercises--if I'm typing actual words, my fingers can find the keys, but if I am typing nonsense, I have no idea where the keys are). I was amazed when I learned, at Jimmy & Andrew's old school, that virtually none of the teachers there knew how to touch type --- this was a school for autistic kids! These teachers spent HOURS of their lives typing up IEP forms. From time to time I wonder whether I could learn the alternative faster keyboard....can't remember what it's called now, but it's not QWERTY. Or would QWERTY be too ingrained to overcome? Yeah, I find that being able to touch type was a huge advantage is writing on the computer. I can basically type as quickly as I can compose, and it is pretty automatic (I was at 76 wpm, but that included a couple of typos that I back spaced to fix which I really shouldn't do in a speed test). I'm pretty sure it has saved me a lot of hours over the years. My mother made me take typing back in 8th grade, and what the class did was basically force distributed practice. Nothing more to it than that! It drives me crazy that essentially none of my students can type.